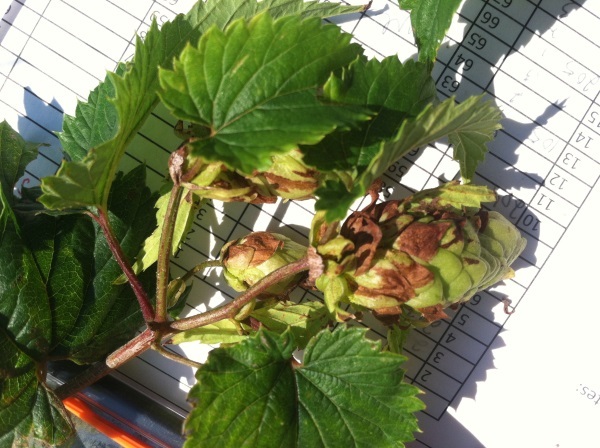 Dark brown bracts are a symptom of hop downy mildew. Why are my hop cones black? Harvest is approaching quickly and for some may be well underway! This season’s wet conditions have resulted in high disease pressure on the hop plants. These diseases are now starting to show up on the cones of the plant. At this time, we have identified primary fungi downy mildew and Alternaria on cones from the UVM hop yard. Photos and description of the symptoms are below. At this point it is unclear what, if any, yield or quality damage will result from disease infested cones. For now, we can say that downy mildew and Alternaria are causing aesthetic damage to the cones that are infected. Hop cone quality will decrease the longer hop bines with downy mildew are left out in the yard because it quickly dries out the cones. 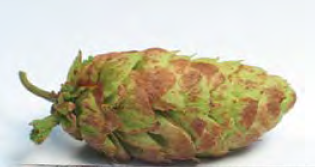 If you are starting to see downy mildew damage on your cones, you may consider harvesting early to reduce continued infection and overall quality loss. If a plant has cones that are completely black, they likely have very poor quality and are not worth harvesting. Remove the severely infected plant material from the hop yard. For further reading and pictures please see “Field Guide for Integrated Pest Management in Hops” (Gent et al. 2009). Reddish-brown brushing is a symptom of Alternaria. Photo: Gent et. al. 2009. This entry was posted on Monday, August 24th, 2015 at 10:15 am and is filed under Uncategorized, What's Hoppening. You can follow any responses to this entry through the RSS 2.0 feed. You can leave a response, or trackback from your own site.